Bangalore: Cambridge University Press India Pvt. Ltd./Foundation Books, 2007. “in no time in the learner’s experience of a language curriculum is the learner expected to take charge of her language input; e.g. to find anything for herself to read and understand, to write, or to listen to. Language learning at school is restricted to reacting to prescribed material rather than being proactive in finding potential language resources” (ibid.). That is especially true for reading within the classroom, over and beyond Extensive Reading/ Listening for pleasure (Templer, 2012). She seeks to challenge this lack of learner autonomy constructively, within a mode of empirical action research. Prof. Amritavalli builds on a notion of ‘authenticity’ of language texts geared to what is ‘real and appropriate’ for learners, chosen by them as they perceive their needs, as based on Widdowson (1979). The study reports on longitudinal data gathered among 15 working-class ELLs, and cross-sectional data working with a group on non-Indian adult ELLs from 10 countries. 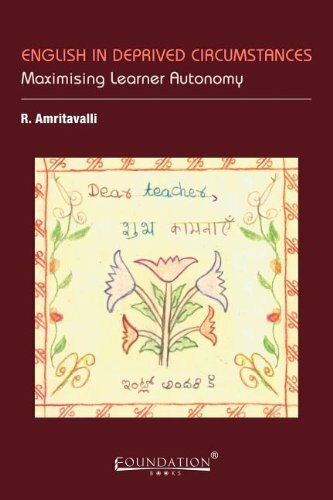 Prof. Amritavalli’s methodology centred on the use of her own class diary/ journal, highly detailed, where she recorded daily impressions, and focused case study of several young learners. The book is replete with reproduced examples of texts chosen by her students. She builds in particular on ideas of Krashen, Vygotsky, N.S. Prabhu (1987), and some of the notions of learner-centred ‘deschooling’ developed by Ivan Illich. Illich’s (1971) work on disestablishing traditional forms of schooling is worth serious discussion in the ELT profession in general, and within GISIG perhaps in particular. It is centred on promoting learner autonomy. The powerfully de-institutionalized autodidacticism advocated by philosopher Jacques Rancière (1991), as a counteractant to the rigid ‘explicative order’ of teaching in most classrooms and curricula, is also worth looking at in this connection. Rancière’s very iconoclastic approach suggests intriguing antidotes to learned helplessness, the ways it straitjackets and silences the learner. The special value of the present study, still little known outside India, is that it is based on fine-textured empirical research on ELL autonomy within a social constructivist framework, especially with less privileged learners. Emphasizing concerns of GISIG, I would argue that (a) the entire question of ‘learners in deprived circumstances’ (however ‘deprived’ is defined, socio-economically, culturally or otherwise) needs to be focused on far more in EFL, wherever taught; (b) the field of EFL pedagogy in much of Europe and the Global South is probably too BANA-centric, dominated by pedagogy stemming from Britain, Australasia and North America, and needs in that sense to be decolonized and ‘indigenized,’ localized (McLaren, 2011; Jamarillo, 2012); and (c) social-constructivist approaches need to be experimented with far more in our classrooms, especially with average learners from lower-income and ethnic minority family backgrounds. Working with learners coming from ‘deprived circumstances’ is a focus that tends to be marginalized in the profession, despite the fact that many of our ELLs — here in Bulgaria where I am based, and elsewhere — are from families with a modest income, and in quite a few schools, urban and rural, stem from minority ethnic social strata where the national language is not the home language. In Bulgaria, a recent report by the NGO Zaedno v Chas (Together in Class) revealed that some 40% of Bulgarian 16-year-olds can be classified as functionally illiterate, and the data suggest “that Bulgarian schools cannot compensate for the negative effects of family environment, of poverty and of low social status, thus ranking Bulgaria at the level of countries such as Peru and Uruguay, not as a European one.” Zaedno v Chas also noted that “in the last 10 years, the difference between the best-prepared students from the largest cities and/or from families with good income and the worst-prepared disadvantaged students and those from the villages is growing” (Novinite, 2012). This is ‘social class in the classroom’ (Finn, 2009, pp. 53-94; Marsh, 2011), and Amritavalli addresses that dimension directly, especially in chap. 3, “What is authentic for deprived learners?” (pp. 28-48). For example, she describes how a group of disadvantaged learners (whose English was a lot below the standard expected of them) were instructed to simply find something that they could read from a textbook. “Every student managed to find something, even if it was only a couple of sentences. Most astonishingly, what we were left with at the end of such sessions of finding readable texts, was a ‘book within the textbook’ that the children could read on their own” (Amritavalli, 2012, p. 3). That ‘book within the textbook’ or ‘hidden textbook’ was made up of short texts of all kinds picked out by learners from their textbook, often with pictures. All were short texts that could be read in 10-15 minutes, ranging between 50-150 words, and short sentences. Many contained illustrations, conversations, passages from newspapers, poems. She notes: “In short, every piece of text that looked short enough to be read by a learner, had short paragraphs, involved turn-taking and dialogue, short lines (as in poems), and most importantly, was a short text, was chosen” (ibid.). Brevity was a central criterion for the learners. A detailed description of this work with self-selected texts is given by the author in the section “The discovery of a hidden textbook” (pp. 35-48). Intriguing is the section “The teacher learns: A new approach to the choice of materials” (pp. 62-67), where Prof. Amritavalli describes how she learned through experimentation to better distinguish between ‘genuine’ texts and pedagogically ‘authentic’ texts actually geared to student ability level and “likely to engage the learner cognitively” (p. 63), a distinction that echoes Widdowson (1979, p. 165). Many texts her students chose in addition to excerpts from their textbook came from the Indian daily newspaper The Hindu. In this study, the underpinning with materials was relatively simple, low-cost and lo-tech, which also is in keeping with GISIG’s aims. But wherever you teach, online newspapers are readily accessible, as is the huge archive of VOA Special English () and engaging texts from BBC Learning English (<goo.gl/07OR>), and other sources. But for most of our younger ELLs, their ‘b-life’ /self-selected reading of books/ is quite limited in any language. So free voluntary reading online is one avenue to pursue inventively (Krashen, 2007). My own experience in working-class Thailand, and in provincial Bulgaria, the lowest-income economy in Europe, confirms this. Dr. Amritavalli’s fifth chapter (pp. 68-75) describes intensive work with a group of adult professionals, ELLs from a range of countries, including Cuba, Laos, Syria and Vietnam. At one point, staying simple and low-cost with resourcing, she offered them a pile of old issues of Reader’s Digest, and told them to select what they wanted to read. She notes that “there was a quantum leap in the amount of material processed by the learner when the choice of reading material was vested in them.” There was also a change in class atmosphere, and by week 6, “an almost carnival spirit characterized the group’s reading” (p. 69). Here again, she provides detailed case studies of several students in the class, with examples of what they chose to read and why, and the range of abilities they revealed. Reader’s Digest is indeed an excellent low-cost, simpler-language resource, though perhaps its engaging texts should be read critically against their often bourgeois American Pollyanna grain. Prof. Amritavalli builds centrally on social constructivism in her pedagogy of ELL autonomy. Social constructivism (Reyes & Vallone, 2008, pp. 31-38, 167-172; Crawford & Reyes, 2011; Reich, 1998) in the ESL classroom at all levels is a good armature for including and energizing student-centred text selection and much independent reading for pleasure. “Constructivists view learning not as a process of filling passive minds with information, but as a process of cognitive change — a literal rewiring of the brain — as children engage the world, building and rebuilding their understanding of it. Early childhood educator Beverly Falk said it best: ‘Learning is something that a learner does, not something that is done to the learner.’ Thus constructivism values questioning, reasoning, analysis, reflection, problem-solving, cooperation, and creativity among the intellectual assets that children will need in school and in life beyond school” (Crawford & Reyes, 2012, p. 32). Interactive constructivist learning is also ‘situated learning’ in social and collaborative contexts of interaction, communities of practice among learners (Reich, 2007, esp. pp. 78-81.). Social constructivism encourages students to construct meanings for themselves, to ‘learn by doing,’ through working together, and also much individualized work, since every student has a different ‘zone of proximal development’ in Vygotsky’s conception. Constructivist educators try to create an open and stimulating environment that is conducive to learning, with a lot of simpler ‘sheltered reading,’ and careful scaffolding for individual comprehension — in this case centred on reading. in EFL grounded on readily ‘comprehensible input’ in Krashen’s classic ‘i + 1’ sense, as Amritavalli (p. 6) stresses (see also Krashen, 2004; 2011; 2012). “As this small pool of learner-chosen materials began to accumulate, there emerged also the need for a full-fledged, systematic investigation into ‘children’s reading choices’ in our country. […] We need to know what, if anything, our children are reading out of school, and in which language. We need to know if the school systems are producing independent readers and whether any non-prescribed reading material is available for them in schools. We need to know whether social stratifications are reflected in reading abilities and availability of reading choices, so that we can find ways of improving our delivery of reading instruction” (p. 9). In regard to whether learner autonomy in reading choices is workable with younger ELLs, she emphasizes: “our experience has been that any learner at any level can take charge of finding what she wants to read, listen to, or even write” (ibid.). One of her final recommendations is for a “systematic survey of children’s reading for pleasure […] if possible in a multilingual framework” (p. 80). A survey questionnaire ‘Exploring your own reading history’ that you might want to use with your own students can be found in Templer (2012, p. 11). The book can be readily ordered from Cambridge UP India <goo.gl/hPXJI> and elsewhere in India and the UK (<goo.gl/o1Uqy>) at a quite reasonable purchase price. Its Table of Contents is here <goo.gl/C8A06>. It was put online open-access last year (<goo.gl/hPXJI>) , but has since been locked up by Cambridge UP and is accessible online only through them. Fortunately, the author’s most recent article (2012) on ‘helping children become readers’ is open-access for all in a new journal from India, Language and Language Teaching. —–. (2012). “A new rationale for dual immersion.” Language Magazine, April: 32-34. <bit.ly/HorbJd>. Reich, K. (1998). “Konstruktivistische Unterrichtsmethoden – lerntheoretische Voraussetzungen und ausgewählte Beispiele.” System Schule, 2(1): 20-26. Reyes, S. A., & Vallone, T.L. (2008). Constructivist strategies for teaching English language learners. Thousand Oaks/CA: Corwin Templer, B. (2012). “Extensive Free Voluntary Reading and Free Voluntary Listening. Some thoughts on why? and how? in Bulgaria.” Presentation, BETA Annual Conference, 31 March 2012, Ruse/Bulgaria <goo.gl/cuQ3D> Widdowson, H. G. (1979). “The authenticity of language data.” In idem, Explorations in applied linguistics, Vol. 1 (pp. 163-172). Oxford: Oxford University Press.